Discussion in 'Checkout My Rig !' started by irab88, Mar 18, 2011. I purchased a 1983 Coleman Sun Valley last month. Lift system is broken so we are working on that. It is popped up right now and held up with boards so that we can work on it. My questions is.. does anyone know if a Sun Valley has a battery or is that something I would need to add to it? 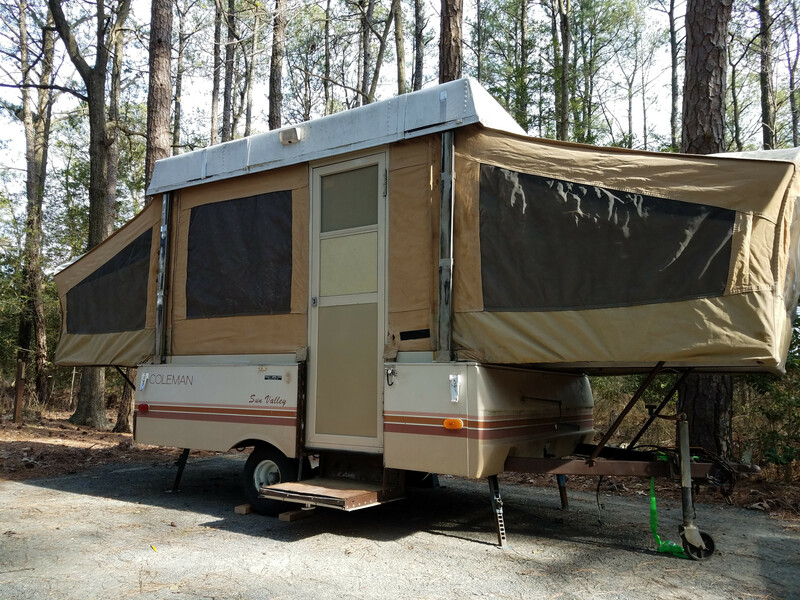 We are new to pop up ownership so trying to learn as much as we can about this camper. I am trying to figure out the water system right now. It seems like everything is looking at it and then trial and error. This camper is in very good condition, although we are putting in a new floor because we like this pattern better. Overall it needs very little but we want to do a few upgrades just to make it nicer. A new counter top is on our list of stuff to do just to improve it, although the one is not in too bad of shape. Hey Jade, Welcome! Just wanted to suggest to you to post your question in its own thread in the appropriate section of the forum. You'll get much more responses that way. Good Luck! I am sorry. I am really new to this forum and I couldn't find a good place to start a new thread asking about where I would find the battery on my camper. I am new to owning a camper of any sort. I have figured most things out by just looking/trying. I was clueless about the water system, but have it figured out now. There is no water tank on my pop up so if I would put water in the potable water port, it would have ended up flooding my camper. Luckily I have looked it over as much as I can to figure this stuff out. It came with a portable grey water tank that they were calling a water tank, but this is not for potable water. Still trying to figure out if we need a water tank or just take gallons of water with us on trips where we won't have water hook up. I am trying so hard to figure everything out before our first camping trip hopefully within a month. I will keep looking for a good forum to start it's own thread though. Thank you for such great details on your project. I am just reading all the posts and looking at the pictures as of 1/4/2017. I hope that you are still enjoying your popup. I am amazed by all the things you were able to accomplish. Must be better than new! Yes, I've been gone for a while, but I still have the trailer. It's been a long while since I used it last, but I've taken it to the mountains, the backwoods, and down to the beach. The last time I opened it up was to get my propane heater out when a snowstorm hit. The trailer is still for sale, I haven't done much advertising, bit I'm in the middle of too many other projects right now, along with a bunch of travel for work. It's good to know the pictures are still up. I got the truck's engine swap done at the end of last year, and took the camper out once since then. It was a nice weekend trip. 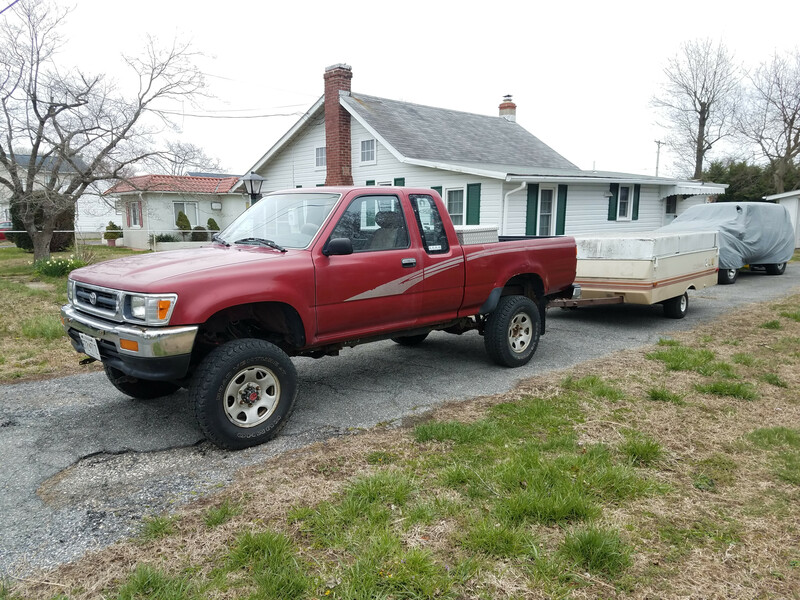 The trailer is for sale. I'm moving, so this is the perfect time to sell it. I'd love to sell it to someone on the forum, as I know it'll get love (if only for parting out).